Since November 2016, Canolfan Gerdd William Mathias has been holding music sessions for older in Gellilydan and Awel y Coleg, Y Bala, led by Nia Davies Williams. Children from the local primary schools have also been taking part in Camau Cerdd sessions (Steps in Music) with Marie-Claire Howorth before joining the older generation to sing and enjoy music activities. 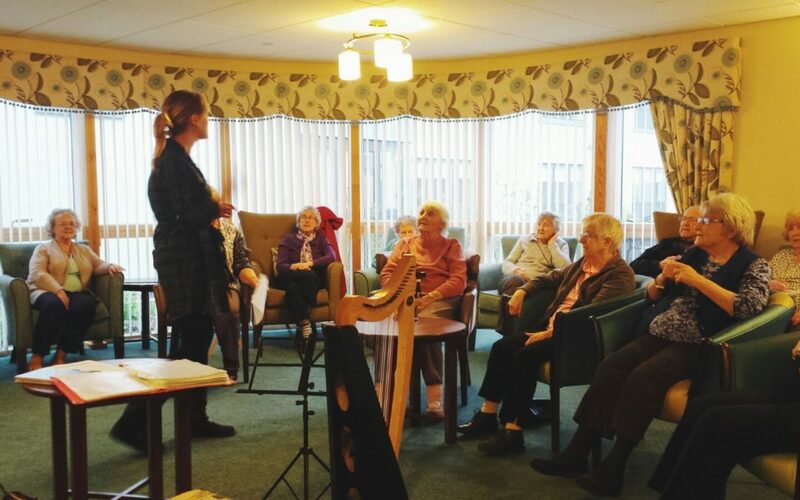 Since being commissioned by Gwynedd Council’s Community Arts Unit, the sessions have helped older people in rural communities come together to meet new people and enjoy music as well as raise confidence. We’re very pleased to announce that sessions will begin in Deiniolen and Bethesda at the end of October. They are open for all older people who enjoy music to come for a cup of tea and a song. Sessions in Bethesda will begin October 27, 10:30 – 11:30 in Neuadd Ogwen, and every other week from there. Similarly, sessions i Deiniolen will begin on October 27 at 14:00 – 15:00 in Tŷ Elidir. A cup of tea will be available after each session and the local primary schools will join in the Spring 2018.